LOCARNO Taking the train to Locarno on Lake Maggiore is one of those trips where getting there is more than half the fun. From the Arc Lemanique, one changes in Brig (VS) for Domodossola, boarding the narrow gauge Centovalli rail line to cross the One Hundred Valleys in Italy and back into Switzerland before arriving in Locarno. The name Centovalli refers to the 100 valleys along the line where tiny towns perch on the hills above. The Centovalli is not a fast train, but it is the shortest and by far most beautiful way to reach Lake Maggiore from Bern and Swiss Romand. From Domodossola it takes an hour and a half to cross 83 bridges, plunge through 34 tunnels and stop briefly in 21 hamlets along the way. But the views are so spectacular the time seems to fly. 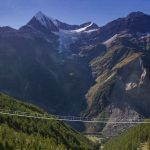 The trains are rarely crowded and passengers feel free to roam from one side to the other to peer down at a vertiginous gorge or gaze in awe at a cascade bursting from the rocks. At every stop it is tempting to get off and explore the hamlets perched on the mountain’s edge, take a cable car at Intragna, go bungee jumping off a viaduct, sit in the sun at a café de la gare or visit a school in Verscio founded by Switzerland’s most famous clown, Dimitri, who was born in the Lake Maggiore town of Ascona. The route has many dramatic inclines which begin as soon as you leave Domodossola and go all the way to Santa Maria Maggiore in Italy. Back in Switzerland the gradient in some places between Verdasio and Intragnar rises 60 meters every thousand meters. The Centovalli was founded in 1918 under an agreement between the Kingdom of Italy and the Swiss Confederation to expand a narrow gauge track that already existed. This set the meter gauge for the entire 52 kilometer line which opened in 1925 and has continued to play an important role for the major trans-Alpine railways passing through the Simplon and Gotthard tunnels. 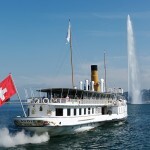 It still provides the best, and certainly most beautiful, connection between the cantons of Ticino, the Valais and all of French-speaking Switzerland as far as Bern. The line has continued to operate as an important economic and tourist link despite the era of motorization when many considered the train to be obsolete. 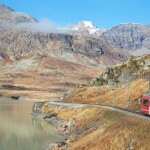 It is still the favored link between the major trans-Alpine rail lines that pass trough the Simplon and Gotthard tunnels and, with the Simplon railway, provides the best connection between Valais and Ticino. When you arrive in Locarno, not to be confused by expats with Lugano, you are likely to feel invigorated rather than tired and ready to explore. 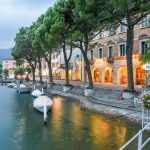 Locarno sits on a sweeping curve of the lake, its streets lined with palm trees and flowering bougainvillea, oleander and magnolias, making it a favorite destination for Swiss and Germans fleeing colder climes. The city was known in decades past as the place where the Locarno Treaties of 1925 created Europe’s post-World War I borders between east and west. Today Locarno is firmly on the map as host of an increasingly popular International Film Festival which takes place each year in August. Must-see sights include the Citta Vecchia with its photogenic collection of arcades and Lombard-style houses. There is a craft and produce market every Thursday and the nearby 18th century Chiesa Nuova has a stunning ornate baroque ceiling. The fortified Castello Visconteo, dating from the 15th century, has a fabulous collection of glass artifacts from the days when Locarno was a glass-manufacturing town in Roman times. In 2004, an Italian historian speculated that part of the castle may have been designed by Leonardo da Vinci.